Q: How do I know these LED halo rings will fit my car? 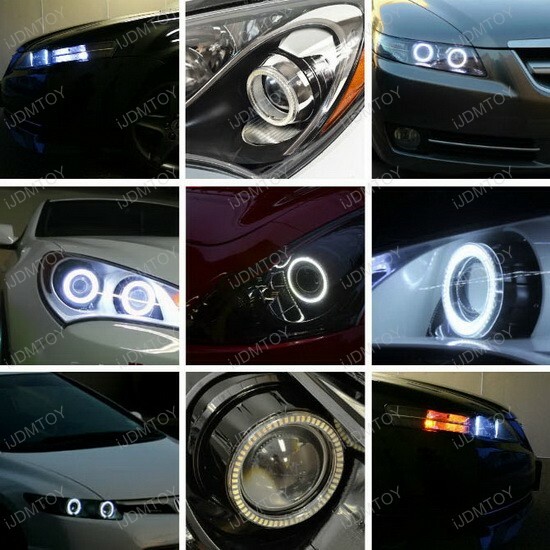 A: These LED halo ring package base on your vehicle year and model. 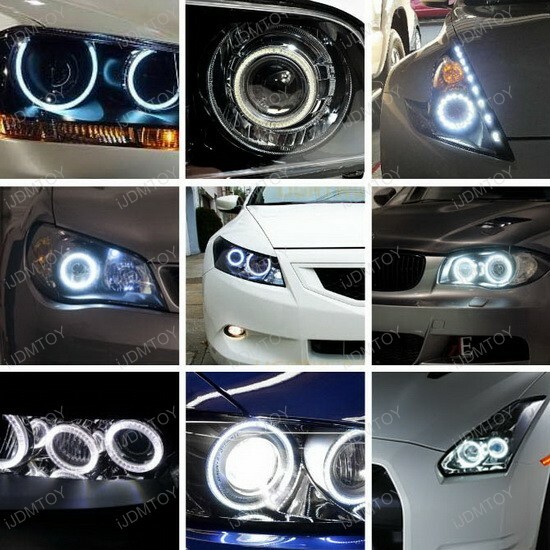 All these vehicle specific LED halo ring sizes are provided by THE SHOP after completing the installation with our LED rings on these particular cars to ensure the proper fitting. However, please keep in mind, this is not a plug and play application, some retrofits are required in order to properly place and mount the LED rings. A: This is a highly customize product so we do not have an exact installation guide for this product. Since there are many modifications such as baking, cracking open, drilling, sealing, and wiring involved, unless you are a super guru about this, we highly recommend professional installation. Q: Where do I mount the LED rings? A: This really depend on the situations. For example some customers prefer mount the LED rings on projector lens and some customers prefer mount the LED rings onto the shrouds. We recommend use double sided tape to initially position the ring and then use silicone glue. A: Please tap the power to the stock side marker lights, parking lights so the LED rings will light up together with the side marker lights or parking lights or even tap to 12V ACC from the fuse box so the LED rings will light up when you start the engine. 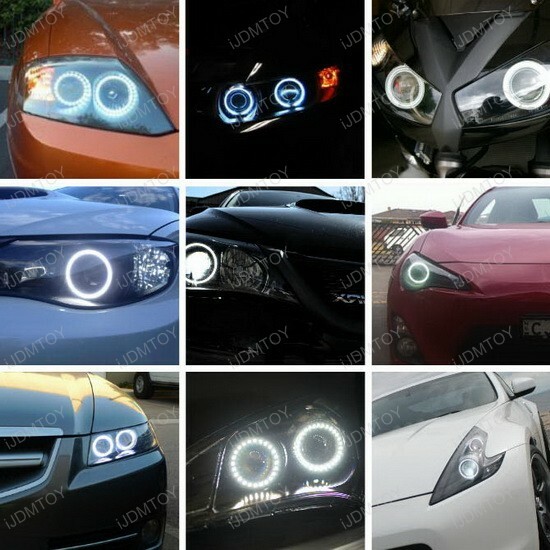 Are you tired and bored of your factory headlight? 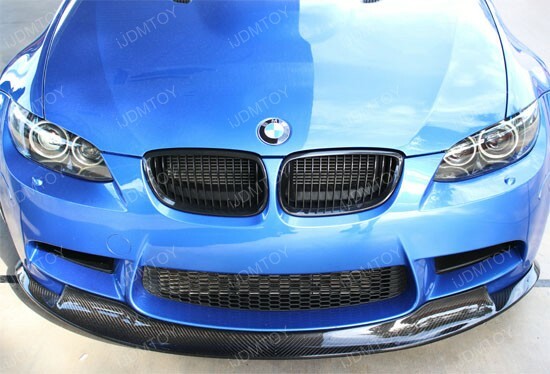 We have a solution for you to stand out from the crowd and bring some life back into your headlights! 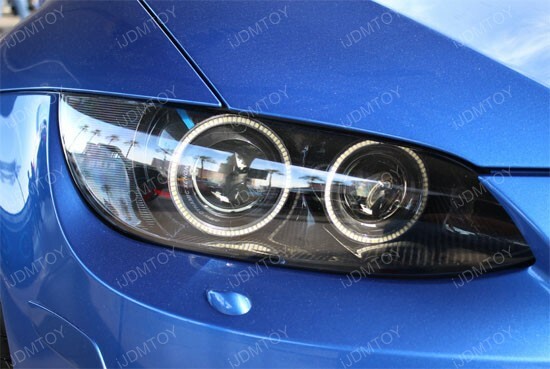 You can purchase our super bright 1210-SMD 6000K HID Xenon White LED halo rings to customize your stock headlamps with a unique angel eye appearance. 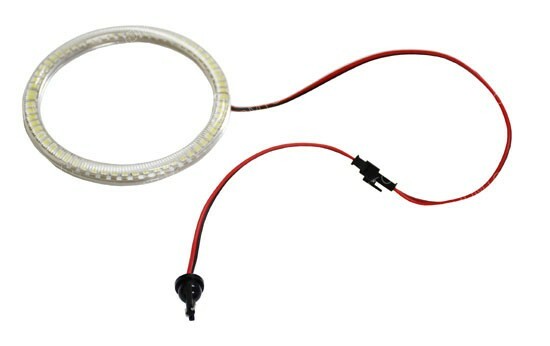 Our iJDMTOY LED angel eye rings have been specially designed to generate bright light output, reliable and a long life span. 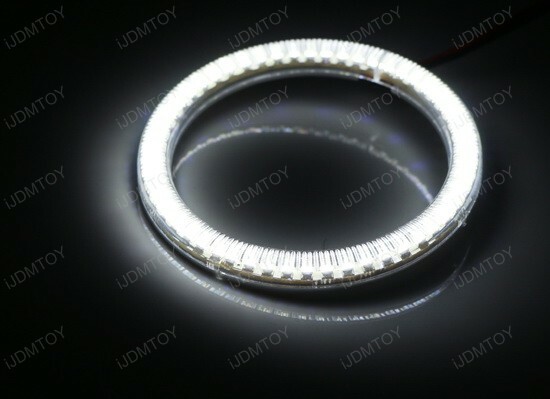 In addition, these LED rings have been tested to ensure the proper fitment. We recommend this LED halo rings to be installed by a professional due to the amount of work required. 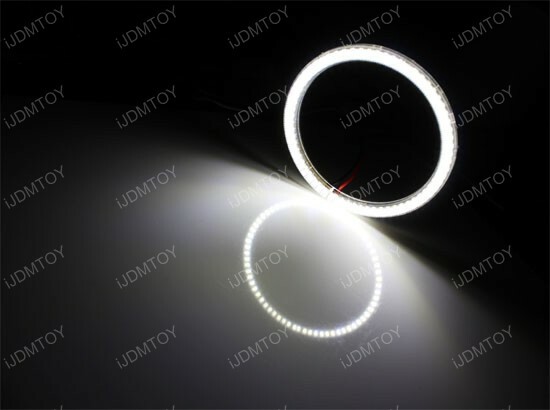 This LED halo rings will require the headlight assembly to be opened and re-sealed, we do not take any responsibility for any damage or labor that is involved with the installation of this product. These rings are to be mounted using either double-sided tape or silicone adhesive glue. We recommend using these with aftermarket or OEM projector housings to allow these to be seated correctly. Modifications to the headlight assembly may be required to fit these depending on the application. Please keep in mind that any modification to the LED ring such as (but not limited to) painting, gluing, or cutting will void the warranty. Please make sure that you test the lights prior to installing to ensure they are working before proceeding with any type of work. 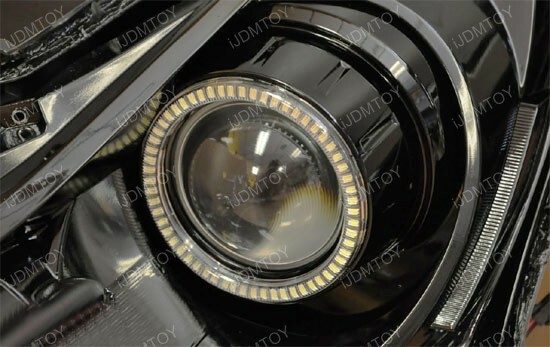 The LED halo rings are designed to fit either right around the projector lens or onto the shroud. The proper ring sizes are provided by THE SHOP. 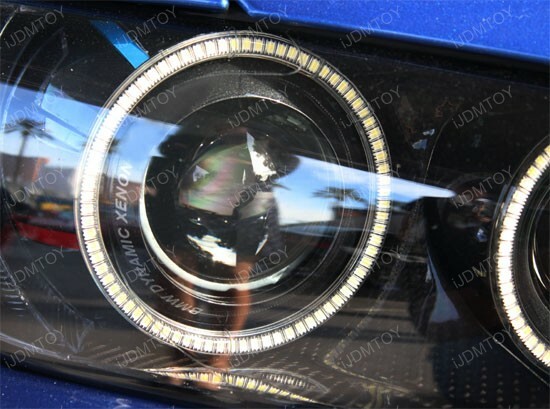 The gallery pictures only give you an idea on how the LED angel eyes will look like. The pictures are not necessarily shown the same car as advertised on this page.